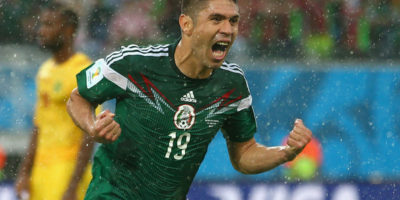 Oribe Peralta continued his good goalscoring touch for Mexico after he netted the lone goal in his team’s 1-0 win over Cameroon in their Fifa World Cup Group A opener at the Arena das Dunas Friday. As expected, Javier Chicharito Hernandez is only on the bench for Mexico, while Samuel Eto’o leads the attack for Cameroon in the World Cup Group A opener at Arena das Dunas this afternoon. LONDON (Sporting Alert) — Samuel Eto’o is a surprised starter for Chelsea in tonight’s crucial Champions League quarter-final second tie with Paris St Germain at Stamford Bridge. LONDON (Sporting Alert) — Jose Mourinho is set to start with Fernando Torres in his attack, while Samuel Eto’o could be on the bench for Chelsea’s Champions League quarter-final second leg clash with the visiting Paris St Germain. PARIS (Sporting Alert) — Jose Mourinho is set to start striker Fernando Torres in Chelsea’s Champions League quarter-final first leg clash at Paris St-Germain on Wednesday night. Fernando Torres has been handed the starting place for Chelsea and will lead the attack in the Champions League against Galatasaray. MANCHESTER (Sporting Alert) — Alvaro Negredo and Edin Dzeko lead the attack for Manchester City in tonight’s Barclays Premier League clash with Chelsea at Etihad Stadium. Samuel Eto’o fired home a hat-trick and Chelsea kept the pressure on the English Premier League leaders by beating Manchester United 3-1 at Stamford Bridge on Sunday. LONDON (Sporting Alert) — Manchester United make three changes from the side that defeated Swansea City, while Chelsea make two adjustments for their Premier League clash at Stamford Bridge on Sunday. Despite making seven changes from the side that played last time out, Chelsea manager Jose Mourinho still named a strong starting side for Sunday’s FA Cup 3rd round clash with Derby at Pride Park Stadium.